We’ve had two Sundays in a row with high winds and tree damage in Rio Crossing and nearby neighborhoods, with many downed and damaged trees on common area property and individual homeowner’s lots. I asked City of Avondale Public Works Assistant Director Sean if it was possible to get a special bulk pickup of storm debris. Bottom line: One-time special storm debris green waste only bulk pickup either late this week or early next week. Please read details! Sean told me that once the crews were done with the Zone 4 pickup this week – or next Monday at the latest – he would have them head over to Rio Crossing (and other nearby Avondale neighborhoods that might have also been affected) and do a special storm debris green waste only pickup. Crews will only be picking up green waste, which includes brush, tree limbs, and yard trimmings. Do not put out any trash, furniture, fixtures, or anything else that isn’t considered green waste. Stumps and trunks greater than 6 inches in diameter will not be collected. Place all items in up to two 4′ wide piles for easy pick up, with no pile higher than 3′ or more than 3′ in depth. Do not include any cactus or palm fronds. 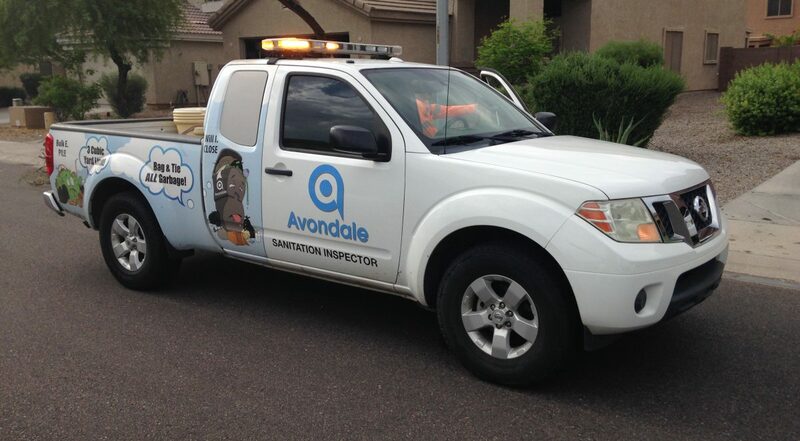 If you need any addition information, please call the Avondale Public Works Department’s Sanitation Division, or contact me directly.